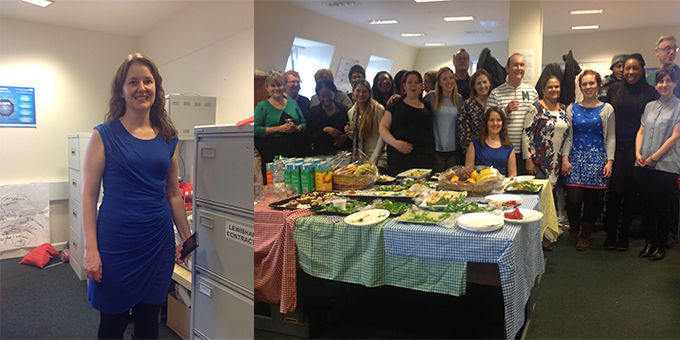 Staff at the North Lambeth Hub, part of the Living Well Network celebrated its first birthday with a gathering at its Stockwell base. Sue Field, Programme Director of the Lambeth Collaborative’s Provider Alliance Group (PAG) remembered the anticipation on November 18, 2013, when the Hub, the new front door to north Lambeth’s mental health services was launched. She thanked staff for all their hard work in the first year. The Hub brings together triage, the Primary Care Support Service (PASS) and the Community Options Team (COT) to work within a ‘primary and social model’ of support, working co-productively with service users and carers to support them to recover and stay well, be able to make their own choices and participate in their communities. Simon Darnley, Head of Clinical Pathways Lambeth MAP CAG, South London & Maudsley NHS Trust, who has been instrumental in helping the team be set up, praised the breadth of experience encompassed in the new way of working. The Hub is managed by Stacey Hemphill and new to the environs is Emma Willing (pictured above left) who takes on the role of PAG Programme Manager. Emma, formerly Team Leader with Lambeth’s Home Treatment Team for four years, trained as an occupational therapist and worked in Wigan and Liverpool within Home Treatment and Forensic teams. Her remit will be looking to roll out the Hub to the south of Lambeth in the new year and focusing on the Collaborative’s Alliance Contracting. Click here to read more about the Hub.